In the past, great cities have been centres of government, military power, trade and manufacturing, which influenced their appearance. Future cities may have all these roles, but they will be predominantly residential. Fifty years ago, 95% of the world's population was rural. In fifty years' time, 95% may be urban, certainly in terms of lifestyle, probably in terms of physical character. Man's home may become a low-density sprawl with high-density nodes. Life in the suburbs of great cities is becoming very similar to life in rural villages and isolated farmsteads. But the city of tomorrow may look very different from the city of today. Clad with slates or tiles, roofs can support moss and lichens but not plants with invasive roots. That is why cities used to be made without vegetated roofs. Today it is comparatively easy to make flat and shallow-pitched roofs that are waterproof and can be vegetated. Concrete, steel and high-strength bricks also make it easy to build load-bearing structures that can carry the load. In high-density cities, vegetated roofs can provide the quiet and private spaces that people need for rest and relaxation. The city of tomorrow will certainly look green. When planners, architects and builders have fully absorbed the reasons for covering structures with leaves, we could see the concrete jungles of today becoming the greener jungles of tomorrow. There may have to be Tiled Roof Conservation Zones, where grass roofs are not permitted, and Brick Wall Conservation Zones, where climbers are not permitted. In new development areas, opposite regulations may become necessary. 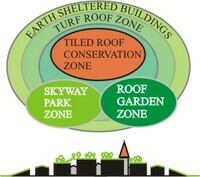 Architects will require waivers from building regulations so that they can put up roofs and walls without vegetation. Eco-cities will be unlike their predecessors. From afar, they may resemble great mounds of vegetation (Figure 8). Landscape planners will have the opportunity to make sculptured roofscapes, so that cities appear to be verdant hills and valleys. Streets will become shady routes carved through the undergrowth. Roofs will become mountain tops. People will become ants.